Christian Smith makes his living being a sociologist, so he acknowledges, in the introduction, that this is a different kind of book for him. Basically it fits into an old and venerable genre of religious literature—a conversion story, told in a way to help others with conversion. In this case, rather than it being technically a conversion (in the sense of the RCIA), it is a transfer from an evangelical background to the Roman Catholic Church. Smith goes through the transition in a conscious way to be of help to other evangelicals who may be seeking something more. He uses two forms to present his material: one is 95 steps, analogous to Luther’s 95 famous Theses; the other is the concept of “paradigm shift” made famous by Thomas Kuhn’s analysis of how shifts occur in science. Through these devices, one gets the sense both of step-by-step progress, but also the “leaps” involved when one’s whole perspective changes. Smith spends several chapters dealing with anomalies—things that might disquiet evangelicals and cause them to question the self-reinforcing circle they are in. Most of this consists in plain historical facts which call into account several ways evangelicals reduce their world to “sola scriptura” and dismissal of centuries of Christian experience (from 400-1500 AD, for example!). He also raises questions about whether some evangelical pride about their famed preaching, worship services, community, etc., might not be somewhat hyped. Smith then presents elements of Catholicism, introducing the “paradigm shift” involving tradition, history, community, doctrinal continuity, liturgy, etc., in such a way that evangelicals, who may be open, can follow the presentation. Along the way, Smith debunks classic evangelical myths about Catholicism, showing their unfairness, and presents specific Catholic doctrines with the proper nuance to alleviate Protestant distortion. 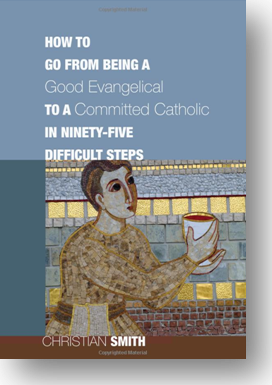 In the end, Smith presents a very solid ecumenical framework for dialogue between evangelicals and Catholics, and a mainstream, accessible account of Catholic teaching, particularly those doctrines that might frighten evangelical Protestants. As a sociologist, Smith has no fairy-tale illusions about Catholicism, but he ably, and powerfully, shows the profound religious and Christian questions that the “Catholic paradigm” can answer for people who are seeking. If evangelicals are looking for a fair presentation of things, this is a fine book. Catholics might benefit from Smith’s treatment of specifically Catholic items with respect to evangelical objections. Catholics serving in the “Bible belt” and near megachurches should have this book at hand for ready reference. It’s a valuable contribution. Review by Fr. Frank DeSiano, CSP.